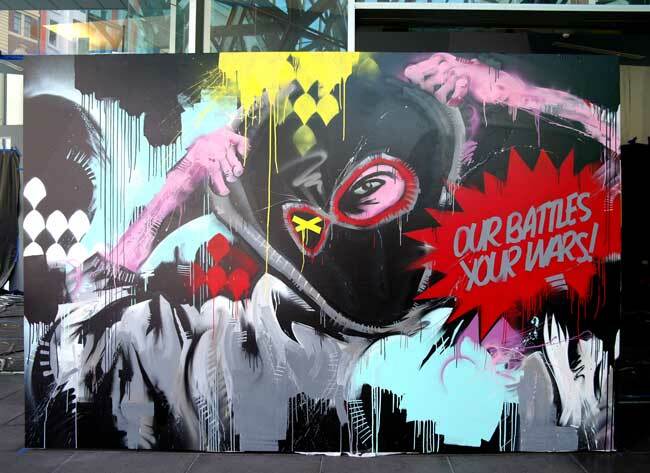 Melbourne based collective Everfresh were invited by the National Gallery of Victoria to be part of the new space soon to open at Fed Square called the NGVSTUDIO. The above clip features the crew at work in the space with contributions from Meggs, Rone, Phibs, Makatron and Wonderlust. One of our favorite Melbourne based artists, Miso was also invited to paint and this marked the first time she worked the crew on a wall. Check the Everfresh blog for the joiner photos of the entire wall before and after. The Everfresh crew also need our help in promoting this online to convince the NGV that they should give them an exhibition later in the year in the new NGVstudio space. So hit up the NGV Facebook or if you have a twitter please use the #ngvstudio tag.